PHOENIX – You’ve got to start somewhere. 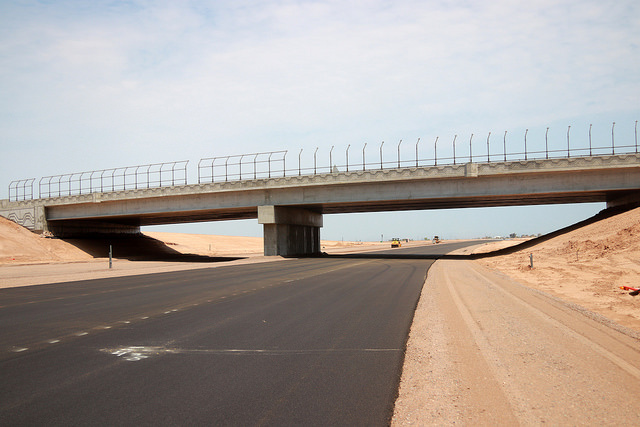 And for the Loop 202 South Mountain Freeway, “somewhere” is near Elliot Road and 59th Avenue in Laveen, where the first lane mile of pavement is in place for the state’s largest single highway project ever. Laying pavement began in late July and has occurred in one of the flattest stretches of the South Mountain Freeway project, from north of Estrella Drive to Olney Avenue. Mainline paving throughout the project will continue until just prior to the opening of the 22-mile freeway by late 2019. Paving will begin later this summer in the Pecos segment east of 40th Street in Ahwatukee. A 4-inch-thick asphalt base has been paved, and additional layers of pavement will follow. To date, paving has not required any traffic restrictions. The work involves several dump trucks delivering the asphalt, paving machines spreading it and rollers compacting it. Connect 202 Partners, the developer of the South Mountain Freeway project, can put down up to 3,500 tons of asphalt per day with a single paving pass. The first step toward paving is creating an embankment and compacting it to the designed height needed for the future roadway. Approximately 10 million cubic yards of earth, the equivalent of more than 800,000 truckloads and enough to fill University of Phoenix Stadium 13 times, is being hauled and compacted for the project. Once the earthwork is finished in an area, paving can begin. Following the paving, crews will add lighting, curbs and gutters, signage and landscaping and complete other related work. The South Mountain Freeway, which is scheduled to open in late 2019, will provide a long-planned direct link between the East Valley and West Valley and a much-needed alternative to Interstate 10 through downtown Phoenix. Approved by Maricopa County voters in 1985 and again in 2004 as part of a comprehensive regional transportation plan, it will complete the Loop 202 and Loop 101 freeway system. You can stay informed about the South Mountain Freeway project and sign up for updates and weekly traffic alerts at SouthMountainFreeway.com. ," it will complete the Loop 202 and Loop 101 freeway system." It would only be a complete 202/101 freeway system if they had made the logical connection at the 101 versus 59th Ave.